Update: On Sunday, March 18, 2018, the Turkish forces and their Free Syrian Army allies seized control of Afrin. No one we contacted in the aftermath of the reported a network disruption. Nonetheless, preemptive warnings can raise awareness about these disruptions before they occur and Turkey could still use this tactic in the future. 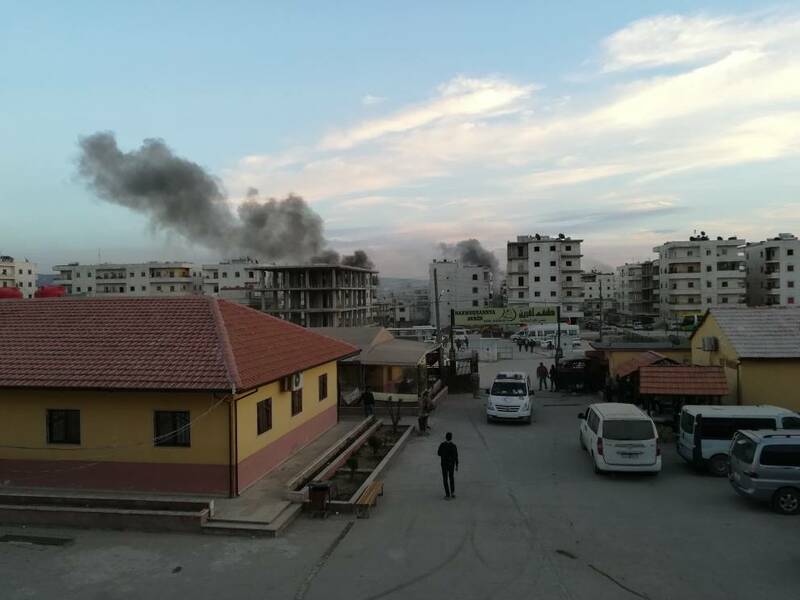 As Turkish and Syrian rebel forces are about to enter the contested town of Afrin in northern Syria, we at SMEX are deeply concerned that degraded internet connections and telecom services, as well as the potential for network disruptions, could make the already dire humanitarian situation even worse. Specifically, our worry about the potential for disruption in the coming days stems from Turkey’s decision to shut down Turkish-provided internet access during the operation’s launch. Network disruptions during violent conflict, including the seven-year Syrian war, exacerbate the effects of war, making it more difficult for people to access emergency services, document human rights abuses and war crimes, and stay in touch with loved ones far from battlegrounds. On January 20, Turkish forces launched “Operation Olive Branch” against the mostly Kurdish People’s Protection Units (YPG) in Afrin, under the pretext of protecting Turkey’s national security and fighting “terrorism.” While the Turkish government claims that no civilians have been harmed in the campaign, the Afrin Health Council reports that 277 civilians have been killed and more than 651 others wounded, in addition to many more undocumented casualties. In addition, the U.N. office for humanitarian affairs said, on Wednesday, that Afrin residents have been deprived from their water supply since last week. Residents of Afrin had come to rely on Turkish internet as a result of the progressive degradation of networks throughout the Syrian war. Although internet access was restored the day after the operation’s launch, residents reported that it had been weakened to the point of being practically useless. Kamo, a Syrian-Kurd who has lived in the Netherlands since 2015, told SMEX that residents “were forced to revert to their Syrian SIM cards, which provide excruciatingly slow mobile internet.” He worried that he might not be able to communicate with his family if the Turkish forces do reach their town, a development that seems imminent according to recent news reports. Years of shelling, sabotage, and intentional disruption has made Syria’s telecommunications infrastructure weak and unreliable. Syria’s two private mobile operators, Syriatel and MTN, often cut off their services at the behest of the government during military or security operations. In addition, reliable and relatively fast mobile internet is usually only accessible in government-controlled areas. Throughout the war, to access the internet, residents across Syria have had to connect to the networks of neighboring countries, including Turkey and Lebanon, or resort to costly alternatives, such as satellite. By May 2017, two-thirds of Syrians were disconnected from local internet service providers, according to the annual Freedom on the Net report, a publication of the US-based non-governmental organization Freedom House. An internet tower in Afrin May 5, 2017. (Rok Online). On Tuesday, the Turkish military announced that they have encircled Afrin, and Turkish president Erdogan has made no secret of his hopes that the town, which until early this year had been a refuge for Syrians from other embattled parts of the country, will soon be captured. While we cannot confirm that Turkey will perpetrate another internet shutdown during future incursions, state-sponsored network disruptions are becoming an increasingly common feature of war. Our recent coverage of an internet shutdown in Yemen and network disruptions in Egypt’s Northern Sinai, both of which occurred during military operations, documented cases of collateral damage and limited access to emergency services in situations involving injuries, deaths, and births. In June 2016, the U.N. Human Rights Council passed a resolution expressing its deep concern with “measures aiming to or that intentionally prevent or disrupt access to or dissemination of information online.” Despite the resolution, the number of documented state-sponsored network disruptions increased from 2016 to 2017, demonstrating willful neglect by states using these tactics to uphold their responsibility to respect, protect, and fulfill their human rights obligations in digitally networked spaces. In all cases, network disruptions and shutdowns prevent people from being able to fulfill their basic communications needs, incur high economic losses, and violate people’s fundamental rights to access information and free expression. Network shutdowns perpetrated in the context of violent conflict, however, carry with them much more severe consequences, including loss of life and a potentially higher incidence of war crimes. While watchdog organizations like SMEX can rarely predict when states will use network disruptions in war, we must learn to recognize the warning signs and preemptively campaign against such acts to raise the cost for states of using network shutdowns as a weapon. In the context of armed conflict, if we wait until a state-sponsored shutdown has occurred, it is already too late.